The Huawei Ascend W2 has just leaked out and it follows in the footsteps of HTC and Nokia who each have one lower and one higher end Windows Phone 8 device. We have already seen the Huawei Ascend W1, the company’s affordable device, and this here Ascend W2 will hit the high-end market. There is only a few things we know about the Huawei Ascend W2, though. First, it’s got an 8-megapixel rear camera with dual LED flash. There is obviously a front-facing shooter as well. Chances are we will get to see it soon, though. 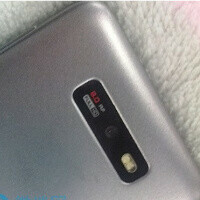 Huawei’s Windows Phone lineup will probably get unveiled at CES in Las Vegas, NV in January 2013. We know that the more affordable Ascend W1 will cost around $300 at launch, so this here should much more expensive. Really?? To me it looks plasticky!! being made out of it and looking like it are two very different things. well its a price of a mid range! so probably only $49.99 on 2-year contract! but it looks good but very plastic! something that make the ativ s special...coz nobody talks about its not-so-likable design! and because its not colorful like the HTC and his highness the NOKIA! Meh. Seen worse. It is plain, but inoffensive. Not sure what they will bring different to the table, but even if it is just WP8 with no extras, it may be worth the look if they can undersell the top Nokia and HTC and at least feel like a premium device. Probably like their Android devices- will sell well in a few markets.